The Cove players and management celebrate winning the title after the final whistle against Forres Mechanics. Picture by Sandy McCook. Brora Rangers pushed them hard, but the Aberdeen side never looked like relinquishing the Highland League title and got the job done with a game to spare thanks to a 1-0 victory at Forres Mechanics on Saturday. They have been worthy winners after another highly impressive campaign, in which they have won 29 of their 33 games and tasted defeat only once. 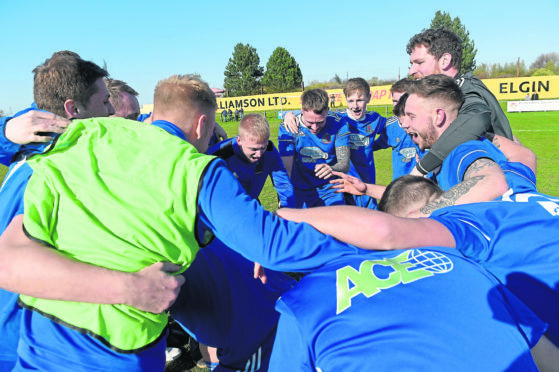 Cove have made no secret of their desire to make the leap from the Highland League to League Two but their past two experiences of the play-offs did not go to plan. In 2016, they were beaten 4-1 by their Lowland League counterparts Edinburgh City over two legs with the capital side going on to claim a spot in the SPFL at the expense of East Stirlingshire. The Citizens remain the only team to have earned promotion through the play-offs in a format that is stacked heavily in favour of the team that finishes bottom of League Two. Cove learned from that experience and went much closer to turning their dream into a reality 12 months ago. Sheran’s side swept past Spartans 5-2 on aggregate to set up a showdown with Cowdenbeath. After an uneventful and goalless first leg where Cove failed to capitalise on their superiority, the second leg at Central Park proved to be a far more controversial and action-packed affair. The Blue Brazil won 3-2 with Cove ending the match with eight men after Paul McManus, Scott Ross and Eric Watson all saw red on a day when several contentious refereeing decisions went against them. Sheran will hope the disappointment and frustration his players felt a year ago can act as extra motivation this time around. They may find their match against the Lowland League winners proves to be the tougher of the two ties, should they prevail. An East Kilbride side managed by former Ross County defender Stuart Malcolm and containing a host of players with SPFL experience, including former Caley Thistle defender David Proctor and ex-Motherwell and Preston winger Chris Humphrey, will be a tough obstacle to overcome. It will either be Berwick Rangers or Albion Rovers who lie in wait for the winners and both have proven they are up for the fight after taking points off league leaders Peterhead in recent games. But Cove will head into the play-offs confident they can get the job done. This would be an ideal time for Cove to make the step up and the perfect end to their first season in their new Balmoral Stadium. It won’t be easy but with the likes of 46-goal striker Mitch Megginson, Martin Scott and Jamie Masson in their ranks, they have enough quality to achieve their goal.